Bettys are perhaps better known for their Tea Rooms, and for the fact that they own Taylors of Harrogate. However, they have a separate online presence and even have their own range of coffees, and they were kind enough to send a sample my way. 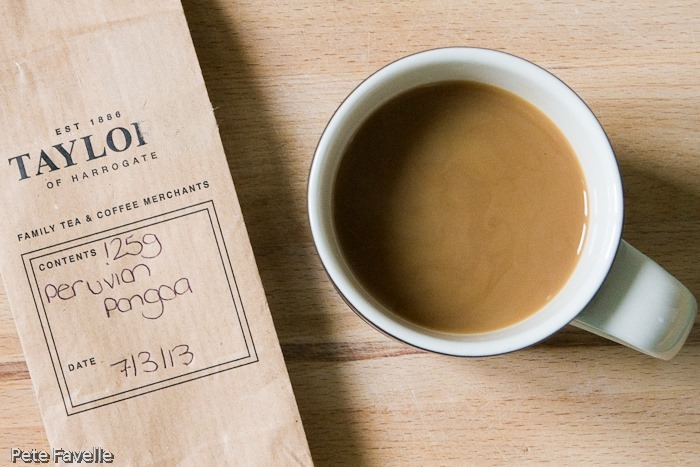 This is their Peruvian Pangoa, a medium-dark roasted coffee from the Ashaninka region. This is one of the areas where the wonderfully named Yorkshire Rainforest Project works, so it’s nice to see that 10% of the price of this coffee goes to the project. The grounds have a nice rich aroma of milk chocolate and redcurrants, an undercurrent of toasted nut and just a hint of pipe tobacco. On brewing, the toasted nuttiness comes through more clearly and there’s still a fruitiness, but the chocolate has gone. It’s not a particularly sweet coffee in the mouth and the fruit from the aroma doesn’t really put in much of an appearance. That said, it’s got a decent body to it, and the nutty character comes through nicely. The finish is short but nicely bitter, with a distinctly tannic hit. Initially pleasant but unremarkable, this coffee has grown on me over time – easy drinking, but complex enough to stand out from the crowd, this earns 3.5 stars. On a slightly different note, can I make a plea to all online coffee retailers – if you’re going to include photographs of coffee beans, could you make them of the actual beans and not just a random generic “beans” image? I say this because Bettys have clearly used exactly the same photograph for this, their Nepal Snow River and Ethiopian Mocha Limu coffees. To be fair, this is hardly an issue unique to Bettys – I actually struggle to think of any online shop that doesn’t do this – and it’s not like anyone actually buys coffee based on how it looks, but it (perhaps irrationally) annoys me. Many thanks to Bettys for the sample. Interesting, but I have now universally given up using beans/grinds for my coffee. Nespresso machine has been a revolution. It’s so convenient, no mess before or after brewing and a reliable crema every time with the coffee brewed under pressure. Some things move on! If only some of these companies produced their coffees in Nespresso pods? Funny you should ask – this weeks coffee company Aromo do just that!